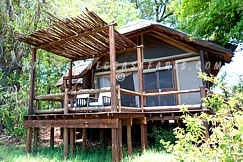 The Chief's Island Concession comprises Mombo, Xigera and Chief's Camp concessions within Moremi Game Reserve in the central Okavango Delta. In the interior of Chief’s Island where Mombo and Chief's camps are located is mopane woodland is interspersed with belts of Kalahari sand and acacia. Towards the edges of the island regular seasonal flooding creates shallow floodplains dotted with wild date palm islands and riverine forest. Mombo offers arguably the best big game viewing in Botswana with prolific concentrations of general game such as giraffe, zebra, warthog, red lechwe, tsessebe, wildebeest, kudu, elephant, buffalo and impala. Abundant predator sightings include lion, spotted hyaena and leopard. Chief's Camp is located in the Mombo Concession on Chief’s Island. Part of the world-renowned Moremi Game Reserve, the area is known as the “predator capital of Africa” and is also home to large herds of elephant and buffalo as well as over 500 bird species. 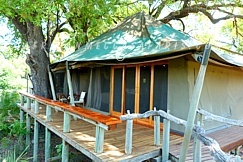 Little Mombo Camp is an extension of and shares the same island as the larger Mombo Camp, matching its high standards. It offers the same abundant big game viewing – some of the best in Botswana – and overlooks a floodplain that is a beautiful setting for a variety of wildlife. Mombo Camp, on Mombo Island just off the northern tip of Chief’s Island, is built under large shady trees and overlooks a wonderful floodplain teeming with wildlife. Accommodation comprises nine spacious tents raised off the ground, all built to maximize the vistas over the plains. 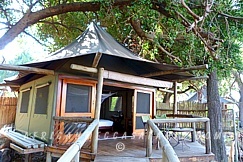 Xigera Camp is situated deep within the Delta surrounded by water and lush vegetation. Nestled in riverine forest on the aptly-named Paradise Island, Xigera has ten luxuriously furnished tented rooms, a clever mix of wood and canvas, each with en-suite facilities and an outdoor shower. What are our Customers saying about our safari holidays? On behalf of myself, my wife and my two adult daughters, I want to sincerely thank you and AfricanMecca Safaris for our fabulous recent safari. Everything you promised exceeded our expectations and was superb, which is saying a lot since this was our second trip, having had a wonderful Botswana Safari 10 years ago. Do not ever hesitate to use me as a reference. Chobe was delightful, less than half full. Sussi and Chuma, very nice, again only 13 people in all. All the game drives and river cruises were excellent. We had great weather. The ability to get really close is in inspiring. EVERYWHERE we went, the people were warm, helpful and charming. Thank you so much. We will be recommending your services to all. Raza Visram at AfricanMecca planned the most amazing trip for my friend and I. I wanted to go to 4 countries in 15 days and he made it happen. It was an aggressive itinerary and Raza planned it so well, that the transitions were seamless. The last leg of the trip was Botswana for another Safari and we stayed at the most beautiful lodge. The excitement in seeing the animals so closely is indescribable. I had a wonderful trip to Africa and I would highly recommend your company.I have been to Africa many times and I have never had such wonderful service. 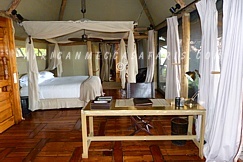 The guide and safari vehicle were both great and all the lodges were outstanding. We will be going to Africa again the year after next and I assure you I will be contacting you. Thanks again for arranging such a great trip. Our Botswana safari was FANTASTIC! It truly was a luxury, but rustic enough, safari. We really loved our trip! We saw everything here. From lions to leopards to elephants to buffalos. Our guide, Rams was truly amazing. He really knew his stuff! While on the bush walks we encountered zebras, warthogs and much more. Thanks for your help! We will definitely do another trip within a year. Thank you for everything; we had an amazing honeymoon. Words really can't describe our experience, all we can really say was that it was the most amazing experience of our lives and we would recommend AfricanMecca to anyone. We hope to visit Africa again sometime next year! Thank you & all of your staff for an amazing & perfect honeymoon.